Tansy is helping to bring in the pumpkin harvest…. We are all thankful for dear friends, kind family, good health, shelter and food enough to eat. Tansy appears to have recovered from slogging through clear cuts on her recent field outing! Tansy has completely recovered…just in time to go off on another jaunt, although she is helping out around the cupboard for a few days first! Good work, Tansy – your tractor is wonderful. The Evergreen :Hittys wish all of the Quimper Hittys a very happy Thanksgiving! Thanks very much Happy and Hitty G…Tansy does adore her tractor – it is so useful for those heavy duty jobs! 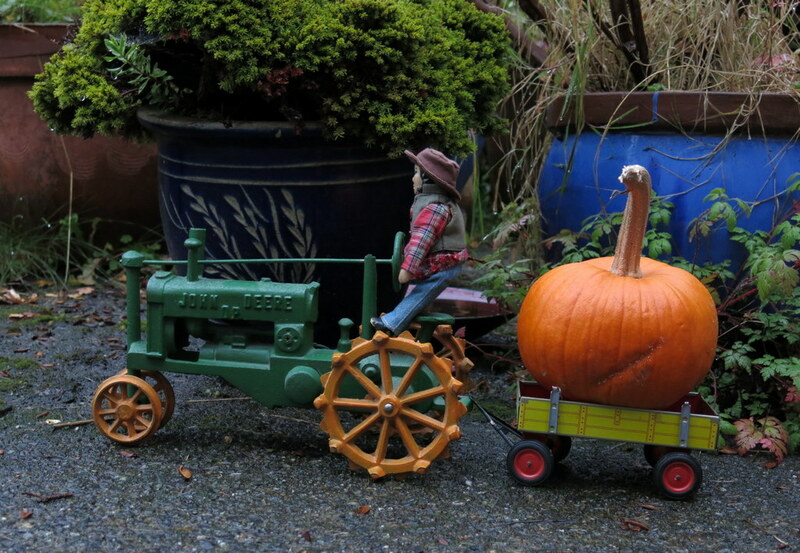 Thank you for Tansy and tractor photo…and yes, you listed GREAT things to be grateful and thankful for. I hope you had a blessed day-with family if at all possible. Some family came and others were unable to make it – we had blessings offered in four languages! The Hittys had a great time! Happy belated Thanksgiving! Love the photo of Tansy and her tractor. Just perfect!! Sounds like your day was a happy one with friends and family in many languages!